During my childhood, our family Christmas dinner was seafood served with pasta, vegetables, and a green salad. 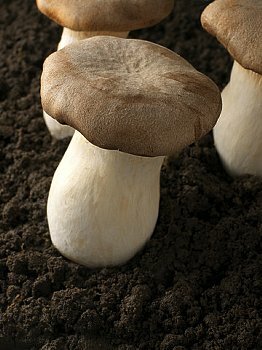 Now that I no longer eat sea creatures, I found a great substitute by using mushrooms. See what you think. Soak arame in 1/2 cup hot water. Heat oil in a large skillet over medium heat. Add garlic, continue stirring 1 to 2 minutes until soft. Add sliced mushrooms, wine and lemon juice. Saute about 5 minutes. Add milk, nutritional yeast, 2 tablespoons olive oil, chili flakes and arame with soaking liquid. While stirring allow the mixture to cook for another several minutes. Season with salt and pepper. Place cooked linguine in a large serving bowl. Add the Vegan Clam Sauce over the linguine. Toss mixture until the linguine is well saturated with the sauce. *Alii Oyster Mushrooms have a nutty flavor, and a resilient firm texture. 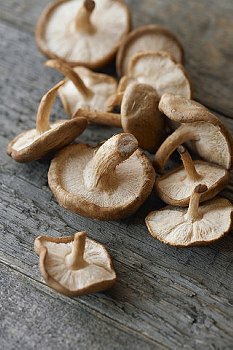 Shiitake Mushrooms have an earthy fragrance, and a meaty texture. Posted on November 27, 2012, in Food, Recipes and tagged vegan "seafood", vegan christmas dinner, vegan cuisine. Bookmark the permalink. Leave a comment.